Like Tom Sawyer and Huckleberry Finn in Tom Sawyer Abroad riding in a hot air balloon, exploring the world is sometimes best done on a different vantage point - from the window seat, for example. That part of the trip may be just incidental, but it still adds something to the journey itself and affords you a different view that you cannot see from the ground. As an example, on my Chicago trip, I passed through Minneapolis from O'Hare on my way back to St. Louis. 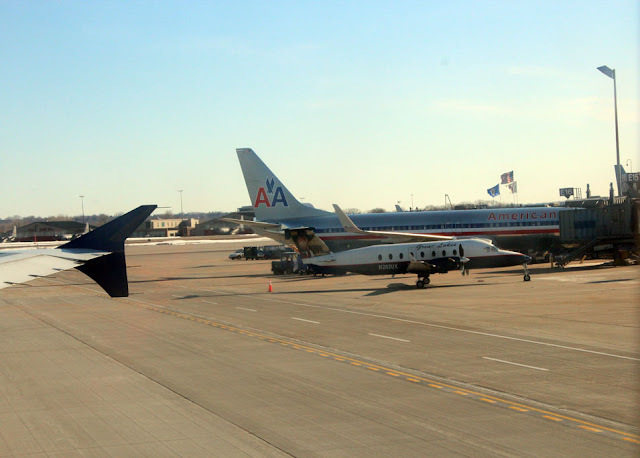 It's kind of weird, because Chicago is just 270 miles away but because of Delta Airline's hub-and-spoke strategy, I first have to fly to Minneapolis, a Delta hub, and spend an hour in layover there before flying to St. Louis. I did the same thing going in, flying to Detroit first before landing in Chicago-Midway. Nonetheless, I really didn't mind. I love flying, and it's an opportunity for me to ride in different kinds of aircraft and experience different airports. Plus, it's a great way to rack up the mileage for my frequent flier card and my Jetlovers profile. 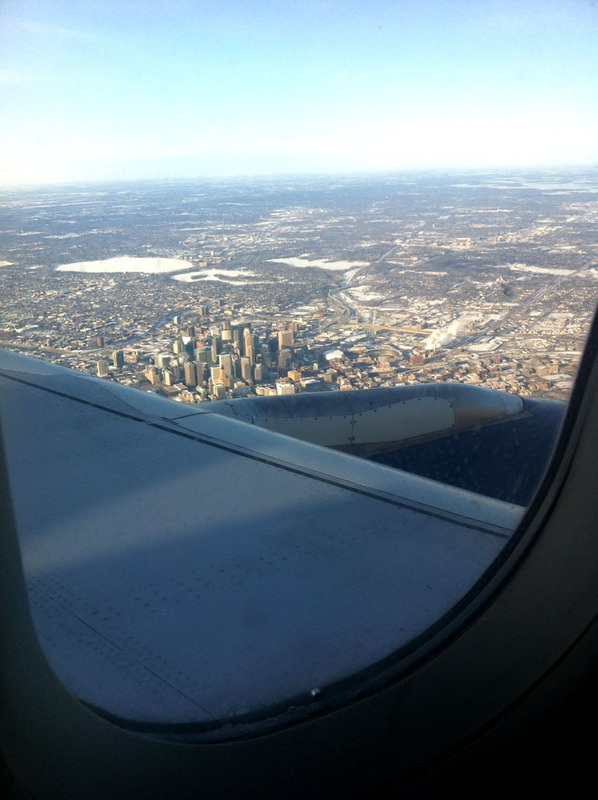 It seemed that Mother Nature forgot about spring when we flew to Minneapolis. 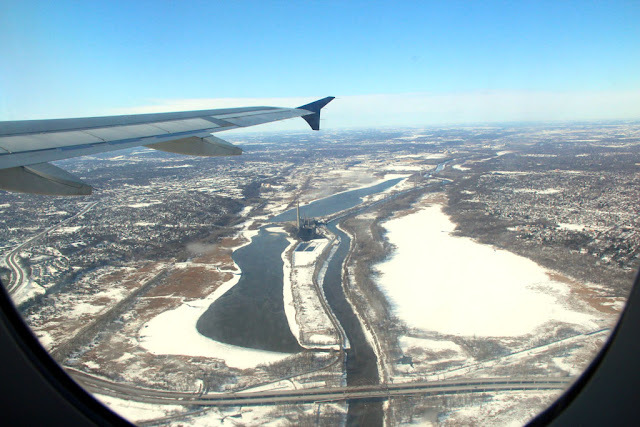 The Minnesotan landscape was still covered in snow even if it was officially spring. In fact, the outside temperature was -12C when we landed. From the air you can see the hundreds of lakes (they call the state "the land of 10,000 lakes") frozen and covered in ice, like pancakes dusted with fine white sugar. 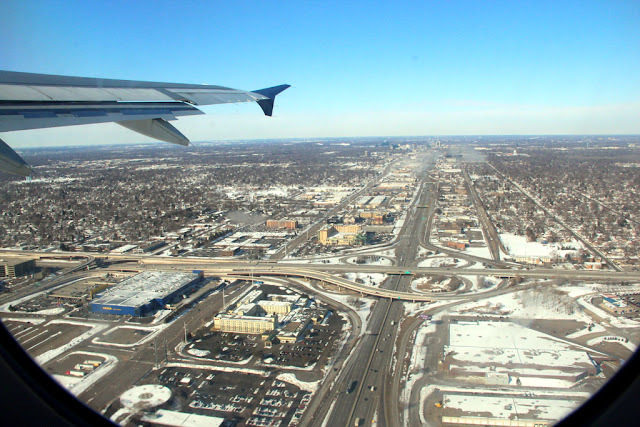 As we approach the Minneapolis (MSP) airport, I can see the twin cities of St. Paul and Minneapolis, straddling the Mississippi and Minnesota rivers, the skyline jutting out like palisades on a snow covered lawn. I can also see the twists and turns of the interstate highways, and the grid-like arrangements of the streets, with snow-topped trees and more frozen lakes dotting the horizon. The one-hour layover was over before I knew it, and I had just enough time to go around the airport to find a shop where I can buy ref magnets for my mom (she asks me to buy her in every place I go to). Then, it was back to the boarding gates to wait for the onward flight. As we took off and the plane climbed to its cruising altitude I took several more shots of the stark, wintry landscape below me, the beautiful desolation reminding me why I always ask for a window seat whenever I fly.